The formation of the National Unity Government in the aftermath of Maithripala Sirisena’s victory at the January 2015 presidential election generated hopes of a rejuvenation of the polity and the unleashing of its full post-war economic potential. However, much to the disappointment of those who believed in the new government, the rift between the United National Party (UNP) and Sri Lanka Freedom Party (SLFP) – which are the two main constituent parties of the government – appears to be increasing with the passage of time. At the root of this is the perennial quest of politicians and political parties for power – to gain it, keep it and not lose it. The present time when the government is composed of the two major political parties in coalition is perhaps the best in which to solve the hitherto unresolvable ‘ethnic issue.’ Other issues such as electoral reform, the form of the executive presidency and economic development –important though they be – can be taken up later. A notable feature of past attempts at ethnic problem solving was that they were made by one of the two major political parties while the other remained in opposition. The lesson of history is that the party in opposition always did its best to scuttle the efforts of the party in government to return to power by using unleashed emotions of nationalism. The failed solutions of 1957 (Bandaranaike-Chelvanayakam Pact), 1965 (Dudley- Chelvanayakam Pact), 1987 (Indo-Sri Lanka Accord), 2000 (Chandrika Constitution) and 2002 (Ceasefire Agreement) provide dismal testimony to this reality. In January 2015 however, the two parties that had been instrumental in scuttling the efforts of each other to solve the problem joined hands for the first time in a coalition government. As a result, they enjoy a two-thirds majority in parliament. The victories notched up by the coalition government at the presidential and general elections were made possible by the near unanimous support extended to them by ethnic and religious minorities. Therefore, the conditions today are propitious for a political solution that has been the aspiration of governments of the past but which were not as fortunately placed with a coalition of the two major political parties. Despite the existence of a UNP-SLFP alliance at the present time, a question mark hangs over the future of the alliance. One of the main fault lines of the present period is that there is more than one power centre in the national polity. There are at least three power centres today. The first is the UNP led by Prime Minister Ranil Wickremesinghe; the second is the SLFP led by President Maithripala Sirisena. The existence of these two power centres within the government means that each can check and balance the other – although at a cost in terms of time, and in reversals and inconsistent decision-making. The third power centre is the joint opposition led by ex-president Mahinda Rajapaksa, which has made clear its intention of overthrowing the government as soon as possible. Indeed, the existence of these power centres also offers more flexibility to parliamentarians to threaten to leave their sinking ship and seek fresh partnerships, whether they be personal or institutional. Sirisena’s position is unenviable as his party members have the option of joining the joint opposition where the majority of SLFP parliamentarians are now housed. Putting an end to the debilitating rift between the UNP and SLFP faction headed by the president requires that an agreement similar to the one that prevailed at the presidential election of 2015 is reached at this time. If such an agreement is reached, Sirisena will be empowered to stop attempting the impossible task of obtaining the support of the SLFP faction led by Rajapaksa. 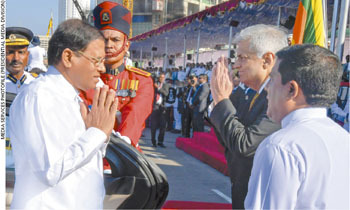 Instead, he can – and must – work as partner of the UNP headed by Wickremesinghe. The UNP also needs to include the president and his team in joint decision-making. The president and PM must do everything possible to work together, consult and decide together in a manner where the two become one. This is the way out of divided and contradictory governance, which is yielding too little fruits for the people who are impatient for fundamental and genuine change that will transform the nation. In resolving the ethnic issue there’s a need for the government to ensure that the multiple power centres that exist today become one – so that cohesive decision-making can take place. The main task of the present government – and the purpose for which it must continue to exist – is to solve the intractable ethnic issue.